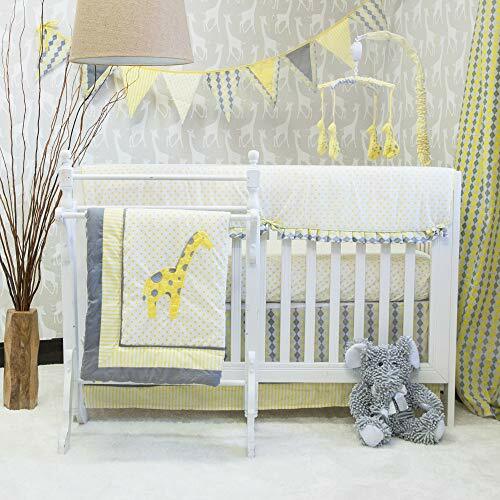 Giraffe theme crib sets are just perfect for a baby's bedroom or nursery which has a zoo, safari or wild animal scheme where little ones can discover these gentle African giants. 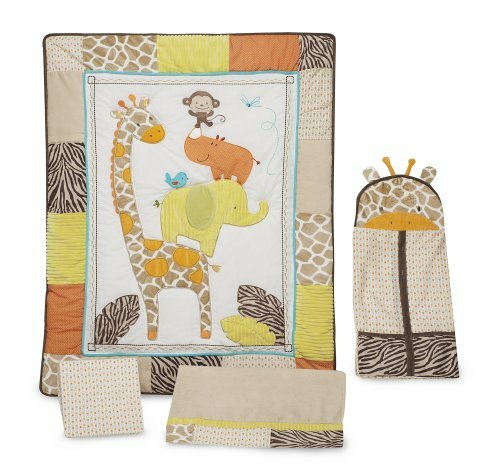 You will find some gorgeous sets of giraffe themed bedding for babies featured on this page with sets suitable for both little boys and girls. This is a great scheme for a gender neutral decor idea as well in case you're planning ahead and don't want to ruin the surprise. 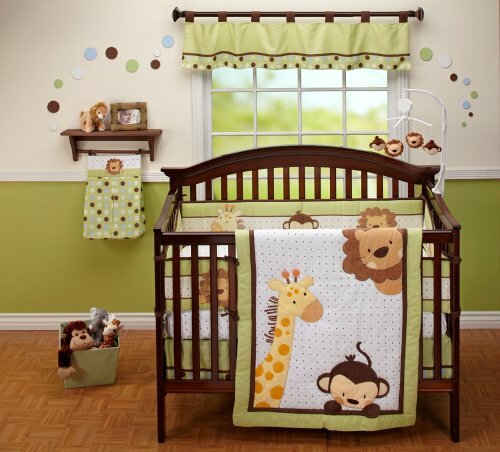 When you decorate a nursery, it's a really good idea to start off by purchasing the actual bedding first so you can then easily match up your paint colors, wall decor and nursery accessories. Apart from furnishings, the crib sets are often the most expensive investment you'll make and it can help to match the rest of the room up with them. 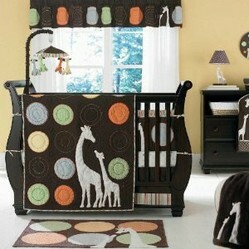 Having giraffe designs on a baby's crib bedding is a great choice. If you think about the animals that young children tend to experience first, they are often zoo or safari animals. This gentle giant makes for a really cute design as part of your overall decor for the nursery or room. I remember this with all my daughter's baby toys and books - it was always giraffes, elephants, lions and monkeys. These were the animals that she became familiar with early on. So it does make sense to choose a nursery and bedding theme on a subject that the child will become familiar and happy with. There are plenty of different piece sets to choose on this page. All of which incorporate this wonderful safari animal. 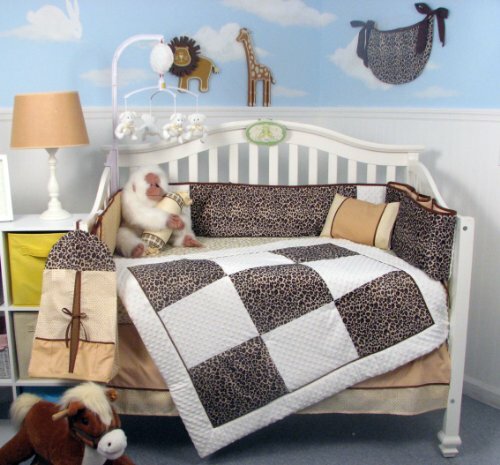 This rich brown set with brightly colored circles that kids can easily see, comes with a quilt, bumper, dust ruffle and fitted sheet. The key difference between these and most smaller sets are that you get the additional diaper stacker which is a cute and handy way to store all your baby's diapers and a gorgeous window valance which is really beneficial in tying in the bedding with the rest of the baby nursery. You can sometimes buy the valance and diaper stacker separately but you can't always guarantee getting hold of them to match exactly with the bedding that you've chosen. So purchasing a larger set is a good way to ensure you get a better range to start with. Being a mom myself, I think it's a whole lot easier to choose the theme you're going to have for your baby's room first - before you start painting or decorating. We did it the wrong way round when I had my daughter. We painted her nursery first, then went with a theme. Boy was it hard trying to match colors up! It would have been so much easier to pick out the bedding first and then use that as inspiration for style, colors, shapes and patterns. That is how I'd have done things if I'd had realized how much easier it is that way round. If you're painting or putting paper on the walls, you can pick out shades which match in perfectly with the crib set. Likewise with flooring, furniture and even toys. I never was entirely happy with my daughter's room. But I learned a valuable lesson there because once she got to 4 and went up into a child's bed, we got the soft furnishings first and then matched her entire room decor up with it. It now works wonderfully well. I hope you've enjoyed reading my wizzles page today, thanks for your visit. I hope your giraffe theme is a great success - I'm sure it will be. Thank you, Brenda. It is lots of fun planning a baby nursery - so many cute things. Those are so cute. It's so much fun planning for a baby. @angel we didn't know whether we were having a boy or a girl. I did go for a scan but she was laying in an odd position and they couldn't tell. I'm so glad we didn't find out beforehand in hindsight. Luckily the giraffe is quite a neutral theme. Thank you for coming by. @sheilamarie - Funny you should say that about the quilt - I also started a baby quilt that I never managed to finish and I still have it in my fabric stash. I was thinking to perhaps use what I have to make a pillow instead. I will show this to our nanny. She is pregnant and having a hard time picking out a bedroom theme for the baby. This would go for either a girl or boy....she doesn't know what she is having yet. Great page. 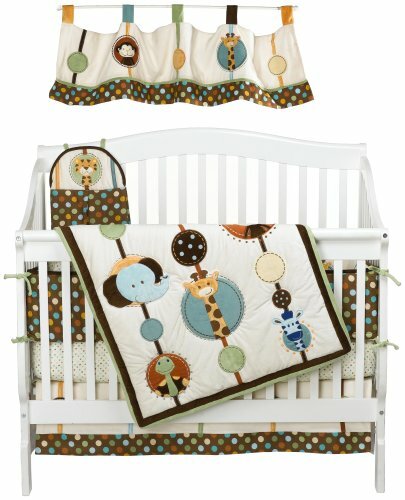 These baby crib sets are adorable! Like you, I didn't always make the best choices when decorating my babies' rooms. I decided while pregnant with my first child that I would make an appliqued quilt. Suddenly things got so hectic that I never finished, not even three babies later. I still have the partially sewn top as a souvenir. It's probably time to toss it! Much better idea to have things set up before the baby is born. Any newborn girl will love pink giraffe baby bedding to adorn her crib. 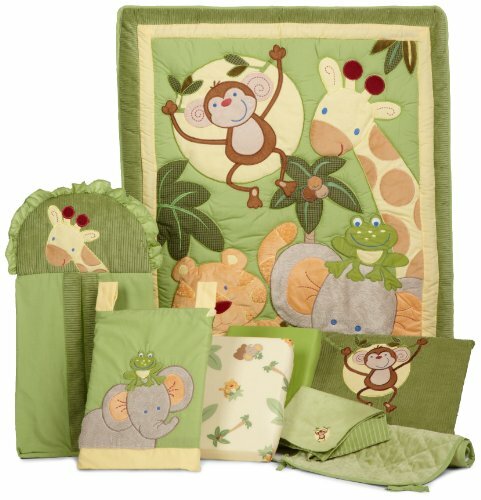 These animals make a sweet jungle theme for a nursery and there are a good selection of sets to choose from. If you're looking for some adorable Giraffe Print Baby Shower Invitations, here's a gorgeous selection for boys and girls which can be customized online and sent to you at speed.